MS Adventures – Set Totally Unexpected Goals! Okay. I have a confession to make. I have to admit that, even though I don’t have television (gasp!) I do occasionally go on Youtube and watch clips from the talent reality shows, like America’s Got Talent or Britain’s Got Talent or American Idol. I love them because sometimes, something totally unexpected and amazing can happen, completely out of the blue. This was one of those clips for me, and it’s NOT a normal “motivational moment” clip. I’ll explain after the video! So this girl comes out, dressed in pink latex to get attention, but not for the reason anyone else thinks. Her goal is NOT to get to Vegas or participate in any more reality shows, but to do something very specific: to meet Howard Stern. The REASON she is my hero is that she set a COMPLETELY DIFFERENT goal than anyone expected, AND SHE DID IT! She just dressed up in something crazy and came up with enough of a “talent” to get an audition, because she knew that’s all she needed. She IGNORED the people who said she wasn’t good enough, because they were assuming the obvious, without finding out what her real goal was. And she was 100% successful in her real goal. I may question her general sanity and taste in men, but she did what she needed to get what she wanted, without hurting or demeaning herself or anyone else. And I think THAT’S awesome! PS Yes, I know some people may accuse her of demeaning herself by pouring herself into that pink latex dress, but I see it as a costume for the character she portrayed to get on the show. I don’t think she took anything about that audition seriously other than meeting Howard Stern. Plus, kudos to her for having the ladyballs to wear latex in public while weighing more than 98 pounds! I’ll Have a Plate of MS With a Side of Crazy, Please! Have I mentioned I’m a bit of a control freak? Not OCD or anything, but it makes me feel safer to feel like I have control. And we all know that MS is not a condition that is easily predicted, manipulated or controlled! So I laugh at myself when I notice how strictly I’m attempting to control certain other things in an effort to make up for it. Like the people around me. Or, you know, fundamental rules of physics. Like gravity. 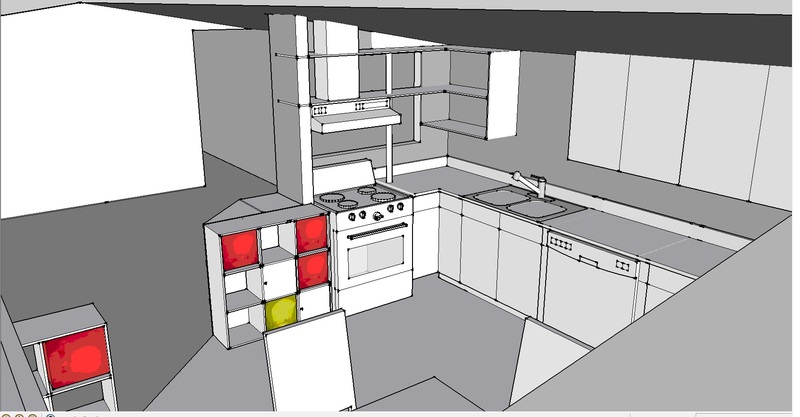 I partially modelled the reno house using the free version of TRIMBLE SKETCH UP. I could NOT figure out how to support that range hood. If you look at the picture you’ll notice the only thing holding it up at the front is sheer force of will! Did you know that if you only support an object on one side, the other side simply won’t stay up? Wishing will not make it so. Gravity trumps wishing, at least in this particular case. And it took me an hour, and quite the little temper tantrum, to come to terms with that yesterday. Another is the five-year-old me, who comes out WAY more than I’d like. She throws temper tantrums when confronted with things like gravity, or the need to explain things when my train of thought is going somewhere I can’t get to. I can only watch myself being that one until she subsides, since everyone knows it’s IMPOSSIBLE to reason with a five-year-old in a temper! And then there’s me, the one who is always present (at some level) and just kind of observing what’s going on. That one feels like the real me, the reasonable one, but it can be hard to introduce her to someone who has just witnessed the five-year-old. So I just apologize. A lot. Eventually I’ll get tired of apologizing, so I really want to learn to work with that five-year-old! Hahaha now THAT will be quite the adventure! So! Does anyone else feel like they’re experiencing an MS- (or any other condition-) induced multiple personality? Anyone else having some kind of strange personality crisis, induced by life changes you’re not exactly sure how to deal with? And does anyone have any advice on dealing with the five-year-old inside hahaha? I’d really love to hear from you! Comment below! MS and Quality of Life from Tanya Asbreuk on Vimeo. I suppose there’s always a compromise between cost and quality of life if you have to pay for treatment. But what’s the cost for your quality of life? In this video I continue the conversation I was having with Lisa who runs Brass and Ivory, a site chronicling her MS journey with links to a lot of other MS blogs, and Amy who runs MS Softserve, a soon-to-be-available NPO site offering customized learning about MS.